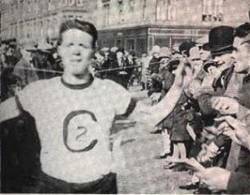 Jock Semple, pictured above winning the Balloch to Clydebank race in 1924, joined Clydesdale Harriers after the first war and proved to be an excellent athlete who always worked on the club committee in a variety of roles such as Junior Captain and as a member of the Finance Committee. A contemporary and friend of Dunky Wright he emigrated to the United States looking for work in early 1923. On arrival in the States he settled in Philadelphia and joined the Meadowbrook club in whose colours he ran his first marathon in June 1926 winning the award for the first Philadelphian. He came back home for a visit in 1927 which lasted 15 months while he received treatment for an injury. While here he ran in the Polytechnic marathon trying for a place in the British Olympic team and finished ninth. He then went on to London for the AAA’s marathon where he finished sixth. in those days they chose six men for the team but they took some from each race and he didn’t make it. On his return to the States he ran in the Boston Marathon where he finished 29th of 250 starters. In 1930 he really trained hard and was ninth in the American Marathon Championships in new York and immediately hitched to Boston where he was ninth in a race that included American, Finland and Canada. He then moved to Boston permanently and that was the start of a very good athletics career. In 1932 he started to think of the Olympics again. He was running well and had a series of three wins in the New England Marathon (1931, 1932, 1933) , he had beaten two of the Canadian team in their own marathon championship when he finished second, he beat two of the Americans in the US championship in Washington, in Boston he beat the third American and the German first string marathon runner. Britain was only sending two marathon runners – his old friend Dunky Wright and Sam Ferris – to the Olympics so a Canadian marathon official and friend of Jock’s sent his credentials to the British Olympic Commission plus Jock’s offer to pay for his own expenses and uniform for the Games in Los Angeles. The offer was turned down flat. His marathon career continued unabated and, unable to get into the British team, he took out US citizenship and competes for the USA in the first Pan American Games in 1937 where he finished fourth. During all this time he was experimenting with himself and with his equipment – he often made new shoes using the skills he had learned while working in a shoe factory in Lynn, Mass. The most exotic ‘experiment’ (his word) was part of a series of tests carried out by Harvard on distance runners. It was conducted in the University’s ‘Fatigue Laboratory’. * He took part in 24 races and won 15 prizes – 7 medals, 4 cups, 2 statuettes and 1 watch. The miles don’t mean much to the present day athlete but we are all children of our age when it comes to training and he was averaging about 42 miles a week. He set up in business as a physiotherapist with the remit of looking after all the athletes who used the Boston Garden and eventually had an exalted private patients list that included the Kennedys, Stan Smith the tennis player, Rocky Marciano, world heavyweight boxing champion and many more. He also coached many winning Boston teams as well as individual winners Young Johnny Kelly and Bill Rodgers. He is probably best known now for his work in organising the Boston Marathon with his friend Will Cloney. There is enough written about that elsewhere but his career as a runner was a very good one and if you want to read more, look at Tim Kerkorian’s book on ‘The Boston Marathon’ and just look up the index for Jock Semple and read all about him. His racing career went from 1926 to 1947 – 21 excellent years with world rankings almost every year even through the War. His highest World ranking was 21st in 1944; his best competitive year was probably 1931 when he was ranked 30th, 31st and even one hundred and third in the world. As a Scot all his life, he donated many, many trophies to the SAAA and the SCCU along with cash to cover any administrative costs or additional mementos to the winners.